This takes pasta salad to a whole new level!! Cook orzo in 2 cups chicken broth and enough water to cover the pasta with twice as much liquid as pasta. Cook for 9 minutes. Rinse the cooked pasta in cold running water to stop the cooking process. You want your pasta just barely al dente. Pour about 2 Tablespoons of olive oil over the pasta and stir to keep the pasta from sticking together. 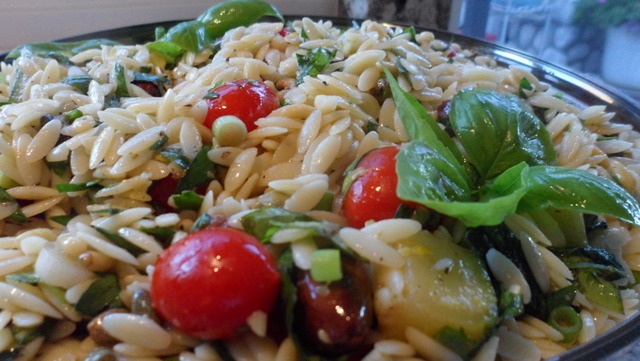 Refrigerate the pasta if using later; if not leave at room temperature and assemble the salad. Cube up fresh zucchini and after seasoning with salt and pepper, sauté quickly in olive oil and garlic just to cook to crisp tender. Cool. Once the zucchini and pasta are cooled sufficiently, mix together. Add fresh lemon zest to mixture and toss to combine zest throughout the pasta. Add salt and pepper and adjust as needed. Now add the remaining ingredients—basil leaves, sweet grape tomatoes, Kalamata olives, pine nuts, capers, chunks of mozzarella. Drizzle a little more olive oil over the salad and gently mix together. If you like, you can also sprinkle grated Parmesan or Romano cheese over the top. Add a healthy grind of freshly grated black pepper and you have a healthy and delicious salad that the whole family will love! This can also be served warm as a pasta dish!